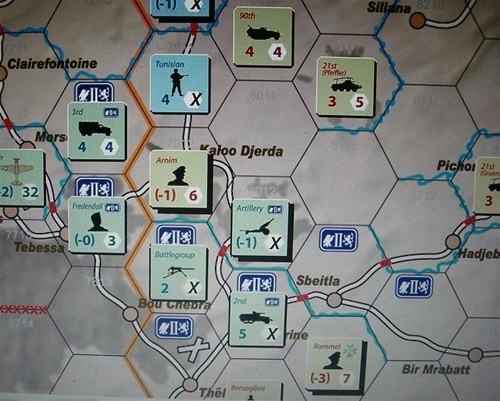 Patton’s First Victory recreates the 1943 Tunisian Campaign, and can be played in 1-2 hours. 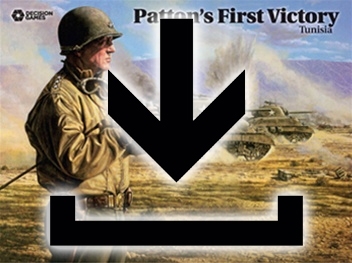 Featuring a full order of battle of all the historic divisions, Patton’s First Victory also includes “support assets” that can be assigned to divisions to increase their strength. Should the Axis player assign his support assets to his best divisions, or use them to augment his light units? The Allied player must maintain the momentum, fighting for a breakthrough to capture enough of the important Tunisian harbors to win. 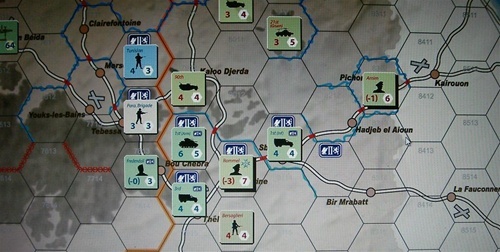 The Axis player must manage his scant yet potent army to repel the attacking Allies, while watching for opportunities to counterattack and throw them back. The Allies possess material superiority, but the Axis units are experienced and are defending in mountainous and constricted terrain. Additionally, Patton’s First Victory (PC), the full computer version, administers all rules and game functions (no AI), allowing players to focus on strategy, and includes internet play functionality, interactivity options (mouse and quick-key, turn restarts, auto save, etc. ), and even an option to modify the victory conditions. The program even provides a statistical analysis of combat results, a strategy guide, automated supply, plus options to turn on/off ZOC, hex control, unit info, casualties, and more. Sound effects (which can also be turned on or off) will immerse you in the game for the full cinematic experience. I've been playing this game off and on for several years before writing a review. No bugs. No fuss and plays like any board game rules. The "game guides" within the game guides you through the moves, Movement, Battle, etc.. It plays on windows 10. Not a complex game but very nice to play. Also runs on Windows 7. Reported to run under Parallels (Mac). The rules are the same as the board game and can be downloaded from this page under the Additional Information/Links tab. Interface help and a strategy guide can be viewed from within the program via the help menu. I just downloaded the PFV game and can't find a manual anywhere. There should be some kind of manual accessible inside the game like that nice strategy guide. At the worst there should be a PDF manual file to allow us to read the rules. While introductory it sure is tough knowing how stuff works without some kind of manual. I declined giving the game a rating since I haven't actually played yet. Well gave it an average rating to post this message.